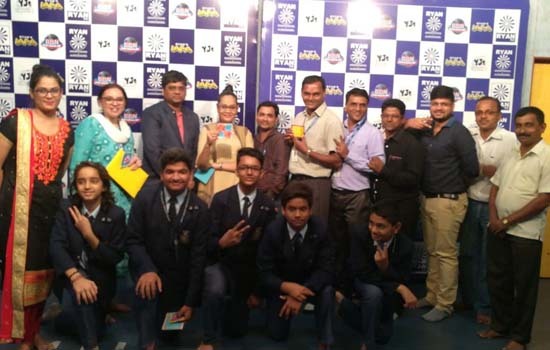 Udaipur: Ryan International School, Udaipur, participated in Beyond Breaking News (BBN) a TV news presentation and production course in Mumbai. The media initiative of the Ryan International Group of Institutions, impart formal training to young student journalist (age group 11 to 21). Five students from Ryan International School, Udaipur, Mst. Pratham Mishra, Mst. Prince Bajaj, Mst. Harsh Taneja, Mst. AabhasShrimali&Mst. VipulOjha went under the hands on Training in fully equipped studios (having a multi camera set-up, chroma key facilities, professional lights, teleprompter etc) at the Ryan International School, Malad (W) and Chembur in Mumbai. Guest to grace the program were Mr. Apurab Kishore Bir- Film maker, Mr. VinodGanatra – Director, FilmMakez, Mr. MilindWagle - Multi Sports Cricket commentator etc. “Education through the Lens”-the vision of the Chairman Dr. A.F. Pinto - Ryan Group of Institutions, is taking wing as it equips the students with the skills for another career option. The certificate distribution takes place at the hands of eminent personalities from the field of media and entertainment.